This is the ideal system for any Lambretta owner who wants a wide powerband, excellent ground clearance, and low noise output. It fits any Li/SX/TV/GP/DL/Serveta model with a standard rectangular shaped exhaust flange, including those fitted with a Rapido or Mugello cylinder kit. The build quality is unbeatable, with gorgeous TIG welds holding together all of the various bits of aircraft quality stainless steel. It comes with everything you need for installation, including mounting hardware, springs, polished aluminum silencer, and detailed instructions. 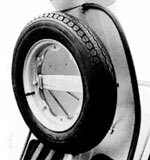 As with all over the kickstart expansion chamber systems, trimming the back edge of the right rear footboard is recommended for optimum clearance. Get this system and you wont be sorry many years from now when other systems have rusted away to pieces!